Only two rookies this season have more than 10 games of Stanley Cup Playoff experience and Ryan Callahan is one of them. Ryan Callahan remembers the energy inside Madison Square Garden for Game 3 of last season's Eastern Conference Quarterfinal series against the Atlanta Thrashers. The chills that went through him, helmet to skate blades, are sensations that forever will be frozen in his body. "I thought it was a lot at the end of the season," Callahan said, "but the playoffs came and the atmosphere in here is just unbelievable." How many NHL rookies can talk like that? For that matter, how many NHL rookies actually have two rounds of playoff experience already behind them? Callahan is one of them – Devils defenseman Andy Greene is the other – which is why even though, by rule, he's still a rookie because he didn't play at least 25 regular-season games last season, he isn't a nervous, wide-eyed kid either. "I thought I gained a lot of experience last year with the end-of-the-season run and the playoffs, so coming into this year I wasn't really looking at myself as a rookie," said Callahan, who scored two goals and appeared in all 10 Rangers playoff games last season. "I was coming in and trying to make the team, but at the same time I knew what it was all about. I wouldn't call myself a rookie, but that's what it is." 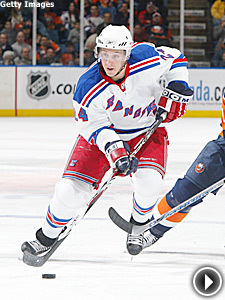 Still, Callahan spent the better part of his "rookie" season fighting for his place in the Rangers' regular lineup. He scored a goal in the season opener at Florida, but eight games into the season he went down with a serious knee sprain that sidelined him for 16 games. Callahan, who plays a speed game that toes the line of recklessness, struggled in his return. He played 16 of the Rangers' next 17 games but didn't produce a single point. By his eighth game back he was being used sparingly. He was a step behind, a step too slow. He was lost. "It was really the first major injury I've dealt with during a season and it was tough for me to get back in the flow of NHL hockey," Callahan said. "It's fast out there, and jumping right back in was tough on me. At the same time, I don't blame my knee – I blame myself. I should have performed better." He didn't, so the Rangers sent him to Hartford to work his game out. Instead of fretting about his lost edge at the NHL level, Callahan called the demotion the best thing to happen to him and concentrated on winning games for the AHL's Wolf Pack. "That was a huge point of the year for me," he said. "That was definitely the right move." "Young guys should feel that way, especially if the feedback you give them is genuine and sincere," added Rangers coach Tom Renney. "Initially it takes time to gain traction as an NHL player on a regular basis. That's the whole idea of going down to find your game and your consistency. That's the function of your minor-league system." Since returning Feb. 3, Callahan has gotten his jump back. He's playing his speed game. He's toeing that line of recklessness. Most importantly, he has played a consistently strong game, allowing Renney to keep him in the lineup. "Maybe the trick would have been to send him to Hartford for the first few games right off the bat (after the injury), but he's come through it well," Renney said. "He's a real good competitor so you knew he would come out the other end of it OK."
That he has could turn into a bonanza for the Rangers. Callahan has the tools be a key offensive contributor on Chris Drury's line, as well as an extra forward to use in penalty-killing situations in the postseason. Better yet, this time around he'll be relaxed. The playoffs now are nothing new to this so-called rookie. "These games now are playoff-type games, so I kind of know what it's all about and how critical every situation is," Callahan said. "It will help me not be as nervous and excited when I'm out there. I can calm down and play my game."